15X25-(2.4Lb) Hand towels Hunter green in premium extra soft quality. Made of 100% cotton popular with hair salons, nail salons, gyms, schools, sports teams. Is your salon in need of a change? One of the fastest and most inexpensive ways to add a little character to your facility is with the purchase of brand-new hunter green hand towels. Hunter green is a tried-and-true favorite hue for many people, since it echoes nature’s beauty. It’s also a warm and calming color that promotes relaxation. 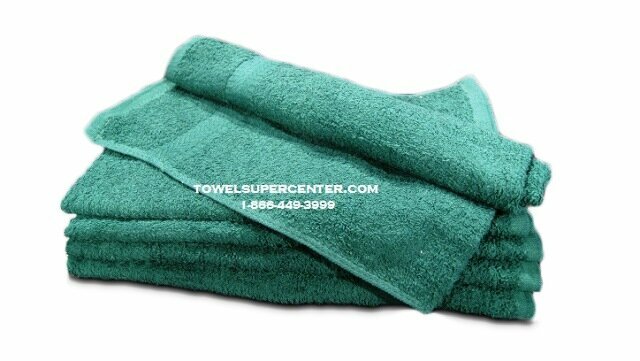 Towel Super Center offers premium hunter green hand towels in a great 15” x 25” size that fits your needs for reliable salon go-to towels. You’ll be proud to use these durable, attractive hand towels again and again, and you’ll love the low wholesale price. Buy enough hunter green hand towels in units of one dozen to stock up for all the seasons of the year! Why is cotton a go-to fabric for discerning salon owners? First, it’s highly absorbent. This means you have to use fewer hand towels to clean liquids or pull moisture. The fewer towels you use, the lower your laundry and electricity bills. Next, cotton is great for all types of skin, including sensitive skin. These towels are incredibly soft, warm and luxurious. Fluff them in the dryer for a minute before using for additional plushness. Finally, it’s easy to clean cotton. Just use your favorite detergent and stain remover, as necessary. Be aware that if you use any type of liquid softener, it may create a barrier that reduces the absorbency. Looking for a way to add a bigger boost of color and style to your salon? Consider mixing and matching your hunter green hand towels with similarly sized hand towels in other shades like red and white. This creates a little eye-catching fun, but doesn’t make it hard to store the towels, thanks to their uniform sizing. Trust Towel Super Center for all your salon towel needs, from hand towels to bath-sized towels. We prove that you don’t have to spend a fortune to get premium 100 percent cotton towels for your clients.